Fr. a-k: Massive fragment of burned iron, matter melted together with four LRA2 body sherds. Intensive thermal distortion: scorching across surface and throughout; deep splitting transversely; large patches of shiny, bubbly metal. Moderate, extensive corrosion and encrustation after melting. Fr. a: p.L. 0.212, p.W. 0.011, p.Th. 0.144 m; frr. b-k: max. p.dim. 0.080, 0.068, 0.062 m.
Fr. l-u: Large fragments perhaps from single massive chunk (frr. a-k?) of burned iron, matter melted together with at least five LRA2 body sherds, one thin-walled coarse-ware body sherd, one roof tile, and possibly one iron nail shank; large pockets of mortar attached, some by melting but some too by corrosion. Same thermal distortion as frr. a-k. max. p.dim. : 0.021, 0.019, 0.019 m.
Fr. v-z, aa-ee: Large fragments perhaps from single massive chunk (frr. a-k?) 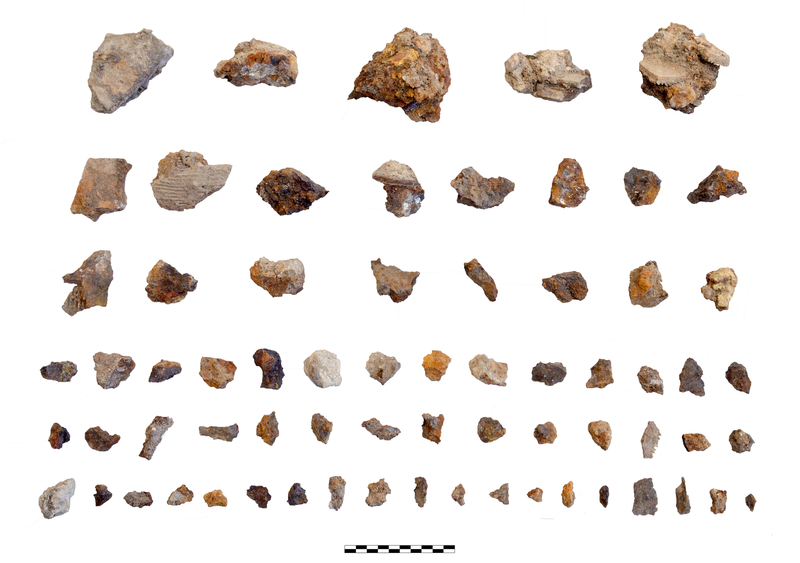 of burned iron, matter melted together with at least five LRA2 body sherds, one thin-walled coarse-ware body sherd, one roof tile, and possibly one iron nail shank; large pockets of mortar attached, some by melting but some too by corrosion. Same thermal distortion as frr. a-k. max. 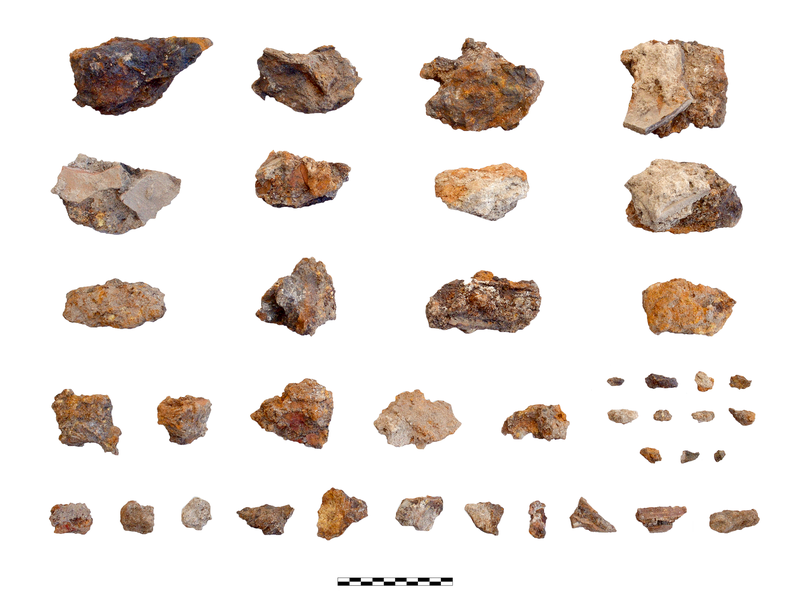 p.dim: 0.014, 0.013, 0.012 m.
One massive fragment (a) and ten related fragments (b-k) of large amorphous mass of burned iron; ten similar fragments (l-u) perhaps from same object, together with 38 smaller fragments of similar character; 15 similar fragments (v-z, aa-ee) perhaps from same object, with 16 small fragments of similar character.